Braided hairstyles are perfect for special occasions and on stage! This follow-up to the author’s first popular book on braids (Letille, WSOY 2015) includes totally new styles. Braided styles are great for punks, goths and rock chicks. They look fabulous in the spotlight and in the street. Braids work on people of all ages, and they’re for men, too: you can be a real-life Princess Leia or a Viking. 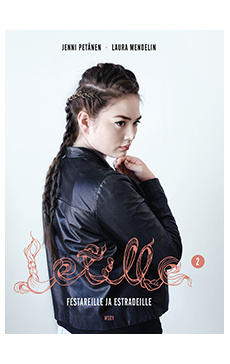 Braids 2 is packed with innovative, bold, different braids and braided styles. The book includes 30 step-by-step illustrated instructions for creating braided styles with plenty of variations: fantasy braids, bold braids, film hairstyles and hair artworks with street cred.